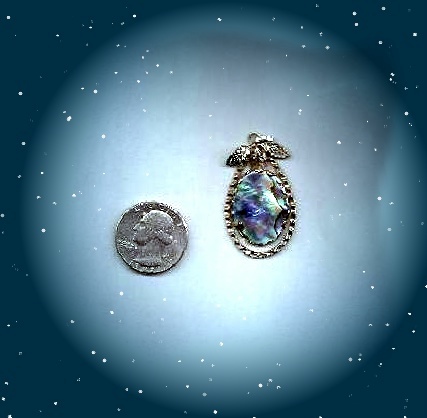 "Goody" Pendant: Genuine Abalone: (blue/green). 25x18mm, oval, domed, polished caboshon. Showy Antique-colored mounting. 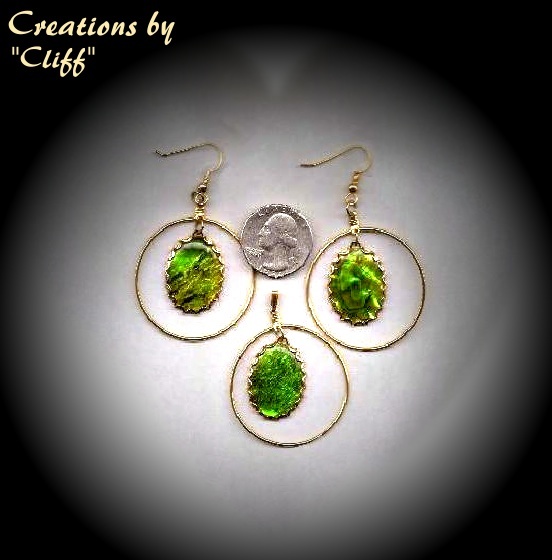 "Outstanding" Pendant/Earring Set: Genuine Paula Shell (green); 3-pcs. 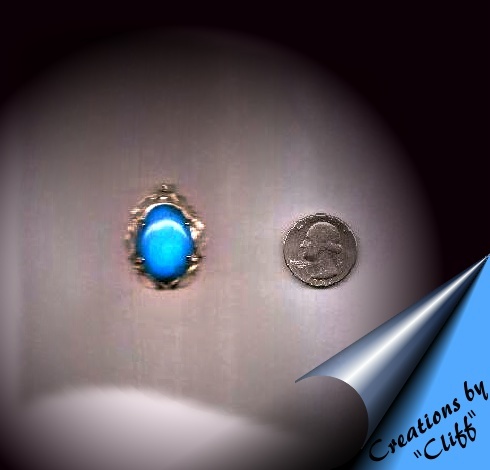 25x18mm oval, domed, polished caboshons. 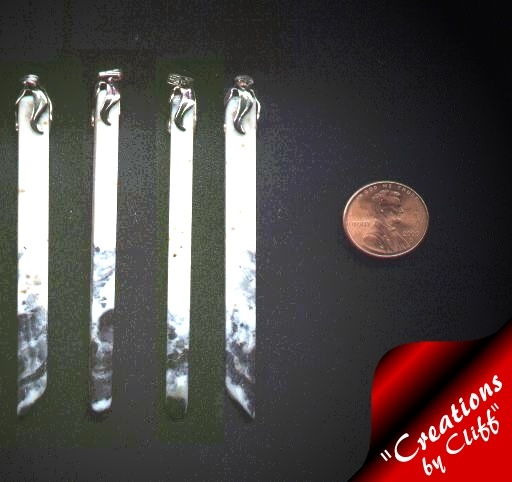 All 3-pcs are 11/2" ring with dangle. Gold-plated mountings. Beauties,for pierced Ears. "The Brook" Pendant: Dyed turquoise (blue with gray veins); 25x18 mm, oval domed, polished caboshon. Lacy gold-plated mounting. 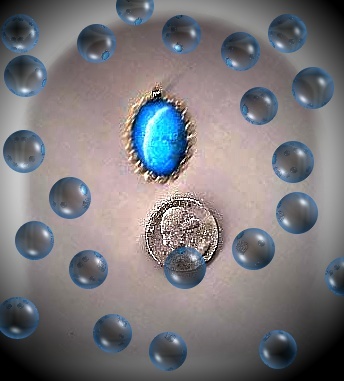 "Placid" Pendant: Dyed Turquoise (blue with gray veins); 25x18mm, oval, domed, polished caboshon. Attractive silver-plated mounting. 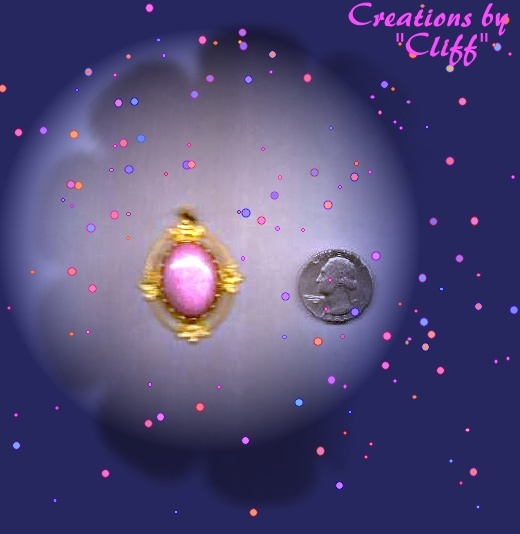 "The Queen" Pendant: Rhodonite (pink beauty), 30x22mm, oval, domed, polished caboshon. Fancy gold-plated mounting. 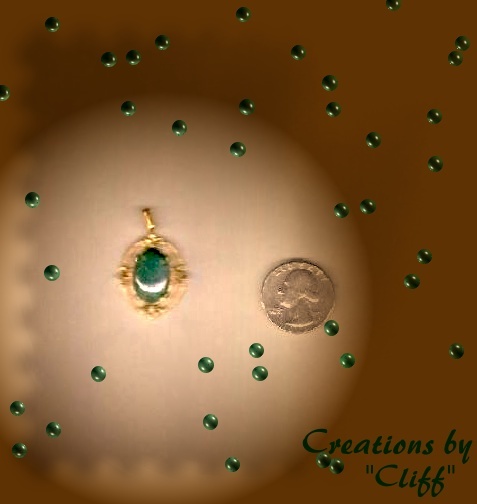 "Proud" Pendant: Green Moss Agate (opaque with green moss clearly visible); 18x13mm; oval, domed, polished caboshon. Pretty lttle stone, in a fancy, gold plated mounting. 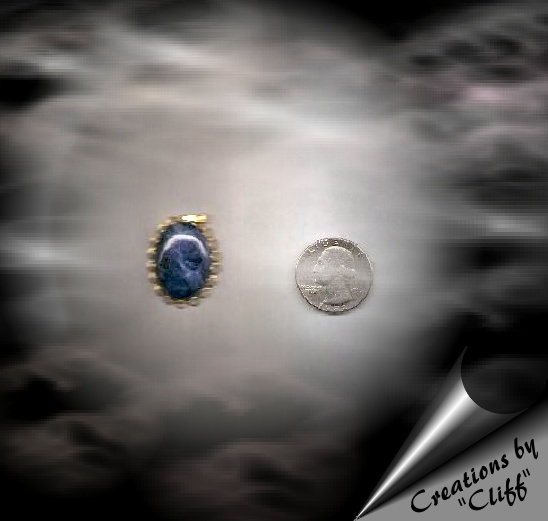 "A Wonder" Pendant; Sodalite (cloudy; Royal Blue and Light Blue mix); 25x18mm, oval, domed, polished caboshon. A real beauty in a lacy, gold-plated mounting. 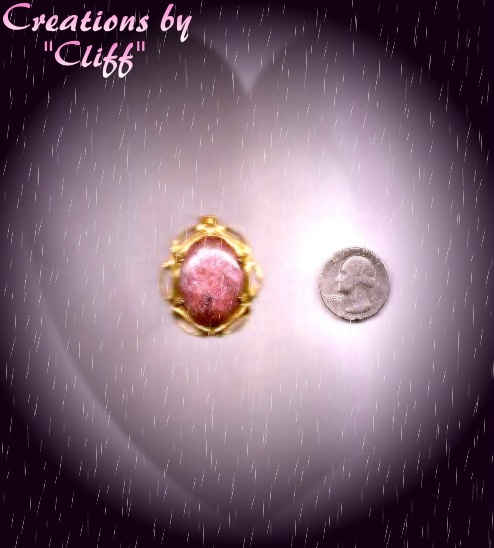 "Royalty" Pendant: An unusual Rhodonite (Burgundy, with a few darker spots). There is a surprise glassy reflection-just beneath the surface. 30x22mm, oval domed, polished caboshon. A classy, gold-plated mounting. "Pixies" 3-pc. 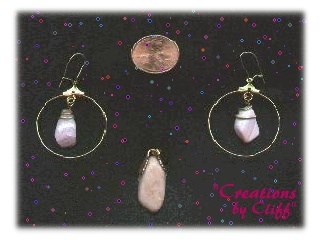 set: Pendant & Earrings; Genuine pink agate; some with white spots and a touch of lavender. Polished to last indefinitely. Gold plated loops and pendant latch. 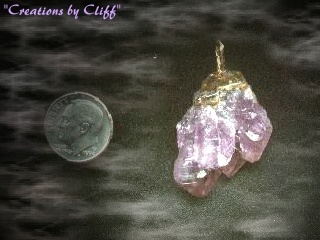 "Amethyst" Pendant: Amethyst; cluster of three natural crystals, the largest is 16mm,smallest is 12mm. Medium purple. Twisted, gold-filed wire loop.Very pretty. 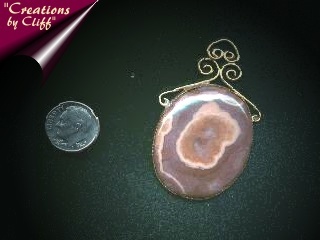 "Fine Wine" ~~SOLD~~ Pendant: Geode; 40x30mm,oval,domed,polished. Colors are: Shades of brown & pink with swirls of gray and burgundy.Filigreed, gold-plated mounting. 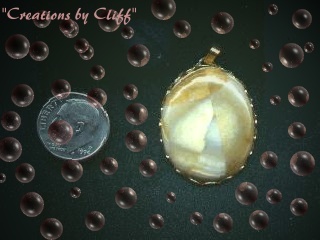 "Sailing" Pendant: A conglomerate agate; browns, whites, grays (a greenish hew). 30x22 oval, domed, polished, gold plated mounting.